Wrestling With and For Truth! 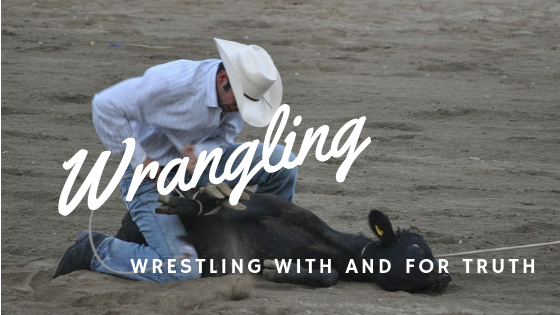 The Truth About Wrangling! Many people today are wrestling with truth! Some are sure there is no absolute truth. Meanwhile, others are giving their lives for truth! Lengthy wrangling, articulate debating, and bull-headed dogmatism abound. Truth is more than a concept; it is a Person! Throughout the ages, many people have spent their lives searching for truth, others have fought fiercely in its defense. A wrangler is more than someone who debates eloquently or a favorite pair of jeans. A wrangler is someone who takes care of livestock. Our family were cattle producers. One spring, the season of serious wrangling, a “town boy”, who happened to be a pastor’s son, was anxious to enter the corral and experience true wrangling. Into the pen of spring born calves he confidently pranced. In short order the poor lad was dragged, dangled, trampled, kicked and bunted. There wasn’t an inch of his apparel not caked, covered and layered in a mixture of mud, sweat and manure. Though we felt sorry for the young green-horn, the real life drama playing out before our eyes was worth far more than any trip to the movies. Although lacking the skill of catching, flipping and holding a calf, he deserved top marks for the effort he brought to the ring. Surprisingly, he had as much fun trying as we had watching. Years later, the image of his arms and legs flailing the air continues to bring smiles and chuckles. If there was one lesson I learned that day it was that persistence pays! Quitting was no where to be found in this boys genes! Those who wrestled and wrangled in the bible carried the same attitude. and a man wrestled with him till daybreak. as he wrestled with the man. Jacob’s painful wrangling gave him more than a permanent limp; he gained a new identity and a generational promise. Until this point, condemnation shadowed Jacob’s life, “You are a thief, a trickster, a liar.” That day, Jacob wrestled for the truth of his belonging. He received a new name, Israel, meaning Prince of God. What about Elijah? The Mount Carmel show down between 400 prophets of Baal and Elijah wasn’t about strength or power. It ultimately was a contest of what is true? Who is God? Is it Baal or is it the LORD? “The LORD — he is God! Truth ultimately wins, though usually not without a struggle of faith. It was true for Jonah, Esther, David, and Moses. It was true for Abraham and Sarah, Gideon, and Jeremiah. Most of the deepest wrangling comes when God bends our experiential truth into alignment with the way of The Truth, Jesus Christ. A man brought his demon possessed son to Jesus. The tormenting spirit had attempted to kill his son many times by throwing him either into fire or water. He doubted if even Jesus could or would help. In prison, John the Baptist wrestled in faith to believe Jesus was The Truth, The Messiah sent from God (Matthew 11). Thomas wrangled to believe Jesus was raised from the dead (John 20). Peter grappled with the truth that salvation was for Greeks as well as Jews (Acts 10). Faith and truth collided on the Damascus road, as Paul brutally faced the reality of his spiritual blindness. Perhaps tangling with truth is necessary for us all! Thankfully, God consistently bends our minds, wrangles our attitudes, and wrestles our intentions into alignment with His. He never quits – never leaves us as He find us. Sometimes I stubbornly resist! It doesn’t make sense! My futile thought processes cannot instantaneously connect faith and truth. I ultimately end up a lot like our young helper many years ago! My wrestling for and with truth sometimes feels dangerous, downright messy, and thoroughly exhausting. God’s truth united with Peter’s faith opening wide the door to preach the Gospel of salvation to non-Jews. The implications of this single instance of receiving truth cannot be measured. My little contending undoubtedly isn’t as dramatic, but I cannot allow myself the luxury of refusing the invitation to come into agreement with God. The bible is the unmoving standard of all truth. God’s word is true! That word is eternal! Never ending, never changing, never varying! Truth isn’t a relative concept that changes with times or seasons. Truth is a Person. Jesus is Truth. Truth never changes because God never changes! In fact, whenever I find myself wrestling with the definitive truth of the bible, I am attempting to wrangle with God. Resist His truth and I can expect to come away limping like Jacob! Yield to it by faith and God alone knows the grandness of the repercussions. Divine truth must be received by faith. That doesn’t mean we throw out sound judgment, critical thinking, and careful consideration. Actually, acknowledging truth is giving full mental assent to its reality. In so doing, God gives us a new lens with which to view Him and the world around us. “Surely not, Lord!” Peter replied. How many times have I responded similarly to God, “Surely not! I have never…”? Wrangling clenches tight-fisted to “never“! Placing experiential truth ahead of God’s eternal truth will reveal terminal fault lines in our thinking. God proves patient, however. He is relentless in drawing us into ever increasing ways of truth. We may wrangle like Peter, wrestling with our “Surely not, Lord!” attitudes. Peter got the message and responded with new understanding. Will our “never” yield to God’s truth? Because God’s ways really are so much higher than ours, we will continue to wrestle both with and for truth. But it is a wrangling that pays benefits!